Captain Bill Reynolds was introduced to the salt water as early as he can remember in Point Pleasant NJ. Growing up in this quiet little beach town he quickly realized when you love to do something so much and enjoy it, it is not work. After working head boats at the age of 12 years old. Nobody could keep him away from the water. In 1985 his parents moved him, the youngest of five and his family down to Florida and became an original transplant. On the first day of living in FL he found a job on a head boat in Port Canaveral. Where he was learning and shaping his love and skills for the marine industry, he did this for many years always looking for an opportunity to become captain. Then their second half of the business raised in FL, Kelley Reynolds. Kelley is a native of FL and at a young age she also fell in love with the open water. Not only growing up on the coast of FL Kelley lived with another harsher aspect of the ocean that did not deter her love. She lived years in the cold climates of Alaska that merely developed her love of the water further. Eventually they resettled back in FL where she spent the majority of her days on the water. Capt. 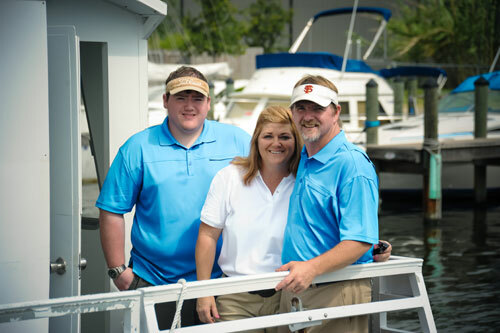 Bill and Kelley met in 1991 on a head boat in Port Canaveral, once they got married Capt. Bill finally attained a captain position after he earned his 100 Ton Master U.S.C.G licenses and his Commercial towing endorsement, he has operated fishing boats, boat deliveries of all kinds and has trained on Harbor tugs. In 1993 we gained the third part of our company Billy Jr. who is a mate on our trips and assists Kelley with the books and is currently going to college as well. Also we have a couple of mates who work part time that are great assets to our business. The future looks bright for Good Natured River Tours as we keep the same goals and values we always have and has has made us good natured people.